My point here is that despite the use of technology such as skype, FaceTime, or any other voice communication software, most communication at work still have to be written. For one reason, most of the times, instrutions, memos, proposals, requests, or any other kind of document needs to be available at a later time. I won’t argue the importance of a nice chat in a business meeting, but I believe you will agree with me when I say that most learners will not be the ones in charge of upfront negotiations. Sure, some will, and these need to develop such skills, but most will be following instructions and trying to comply. They will probably be emailing foreign clients or suppliers asking for something, not calling them. It is much easier to sort out a mistake if you have written proof of what has been agreed on. Again, unless you record all of your phone calls, emails are likely to work much better. In addition to this, we can also think of teenagers. No matter how easier it gets for them to speak to their friends, they do seem to prefer texting. For one reason, it’s much more private to text than to speak on the phone. Only those who are looking at your screen are able to read what you’re typing whereas anyone around you will have an idea of what you’re saying. Most people will only have a chance to practise their speaking skills when traveling for pleasure to Disney or going shopping in NY. I’d love this to change; I just don’t see it happening so soon, though. However long ago writing really started, it has remained for most of its history a minority occupation. This is part because although almost all human beings grow up speaking their first language (and sometimes their second or third) as a matter of course, writing has to be taught. Spoken language, for a child, is acquired naturally as a result of being exposed to it, whereas the ability to write has to be consciously learned. Most students, especially these days, look for language classes that promise an emphasis on conversation. This means a lot of speaking practice and very little grammar – especially to the learner. If you allow me, I don’t think they are actually looking for conversation alone. I do believe what they mean is communication, and the reason why they dread sitting through grammar lessons is mainly because of the bad experience they had been through while studying in school. “Grammar lessons were not communicative nor engaging. Therefore, if a course teaches grammar, it will never teach me how to hold conversations” may be one of the things crossing a learner’s mind. When we ask our learners to write, we are going to correct them on their grammar sooner or later. It’s actually a good thing for the teacher as it might show him or her a couple of things that students need further practice in. Learning how to write is time consuming, and based on the L1 teachers I talk to, it is something that students have difficulties with even in their L1. I have to be honest and say that it is exactly because of the fact that learning how to write is usually frowned upon by students that most language schools and teachers fail to emphasize it. This sometimes doesn’t even have anything to do with beliefs or lack of will, but it may just be a matter of how students see it. Language schools are, let’s not forget that, a business. In order to be able to exist, hire and pay teachers, they need students. If there is another school across the street that says students will be able to learn the language in less time and studying much less, many students will eventually go there, and now the other schools have two options – follow suit, the easy way out, or try to stick to its beliefs and hope that students will see they are right and come back. Whenever I think of this I remember the recurrent articles published every year about language courses that should be avoided. However, as long as people believe in magic solutions and are afraid of working harder than others to reach their goals, they are likely to buy it and go with the flow – if they turn out to have been fooled afterwards, at least they were not fooled alone. I believe it’s much easier and faster for learners to refer to their explicit linguistic knowledge in order to progress than for them to base their learning experience on speaking practice alone. “Eh?! What happened to language being conversation driven, you dogmeist you?? ?” Fret not, I’m a firm believer in the fact that language is conversation driven (at least until today). Written production may be an excellent source of input for learners and also an excellent source for them to learn about their own mistakes and be more conscious of them while holding a conversation. Let’s not forget that there are still many illiterate people out there who can even speak in public very well, but are incapable of reading and writing. Yet, I’ve never seen anyone – please, let’s not go into disabilities – who’s able to read and write but can’t speak. Much on the contrary, even in L1, it’s quite common for us to witness people becoming more proficient speakers once they start writing more. I really don’t think you’ll become a better writer by speaking more. To sum it up, writing and speaking are both important skills that should be well attended to in class. My point, however, is that we tend to go from one extreme to another quite too fast. It is much more pleasant to talk to others in class than to write messages. You don’t walk around writing things on a piece of paper and showing others, but, IMHO, when it comes to foreign language interaction, writing is still a lot more common than speaking. A good example of it? How many voices do you know from the people in your PLN? ** A big thank you to @ma_luv2teach for helping me think more about this topic. I’m far from having this as my final word on it, and I do hope others (if they could put themselves to read this till the end) can also help me on this one. Just wanted to say – great post. I’m going to be uncustomary curt and short – you said everything so well. I always enjoy reading Conrad simply because of the fact he was a 2nd lang. writer. Amazing, not easy. However, what about google translates new forays ….? They are really doing some amazing stuff and they could really alter the terms of the debate. The best/smartest part of Google in my honest opinion. Thanks for this – really useful. Have just made a link to it on the TeachingEnglish facebook page http://www.facebook.com/TeachingEnglish.BritishCouncil so that contributors there have access to your post as well. Please feel free to post there directly when you have anything else you’d like to share. Many thanks for that. I’ve just liked the page and started following it. I wasn’t aware of it – there are just way too many things out there for us to be aware of all of them, right? Thanks so much for enjoying the post to the extent of sharing it there, and for pointing me to such a fantastic group. First of all I would like to commend you for always bringing up great discussions to your blog. As I have always told you, I wish I had more time to go in depth into your proposed discussions by providing thorough comments. However, writing is one of the language domains that intrigues me the most and teaching it has always been a delightful challenge to me. Also, the teaching of writing for English language learners has been part of my M.A. thesis. (Which I am still trying to conclude at this point in time.) So, I would like to contribute to your post with a few lines via comment. As for Harmer’s quotation, it is essential to emphasize that not only speaking, but also listening are biologically acquired and yet learned by children as they grow (Fromkin, Rodman, & Hyams, 2002). As they listen to parents and articulate their verbal utterances, they are able to establish communication within the environment they live in. They experiment with language each day and learn how to use it according to each context they immerse themselves in. 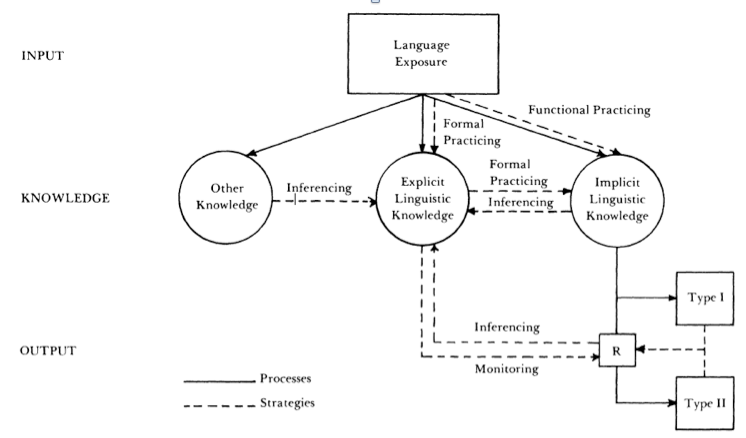 Fromkin, Rodman, and Hyams (2002) reiterate what Harmer said by adding that not only writing, but also reading have to be learned via “formal instruction.” The authors also critique the theorists of the Whole Language Approach by saying that they did not take into account how children acquire language when they were designing the teaching of reading via phonics. Furthermore, Murray (1990) states that “the skills of reading and writing are intertwined.” Thus, when deciding what is important to be taught to either EFL or ESL students, teachers have to consider what the needs of their students are. My decision to focus on writing resulted from the low scores from the WIDA ACCESS Test for ELLs®, the state language proficiency test my students sit every year to assess their language development in the four language domains. It was noticed that students were achieving higher levels of proficiency in all the other language domains except in writing. Taking into account that they are immersed in a rich second language environment with multiple opportunities to develop their second language skills, I wondered why they were not able to develop their writing skills accordingly. I found that by fifth grade, some students were still writing in a second grade level. One of my strategies to enhance their writing skills was to combine Web 2.0 tools and the computers available in our classroom, creating a digital writer’s workshop using VoiceThread (VT). Via the use of VT, students were able to read, listen, speak, and write their narratives in first person using the Internet. The preliminary results have been quite satisfactory for students were able to master some of the six primary traits I have chosen to address during the study, in our mini-lessons. But what I really want to say is that the foci of teaching will change according to setting, needs, and hidden curriculum. It is up to the teacher to decide what the focus of his teaching will be. As for EFL, I believe the teaching of writing is sound because students are literate in their first language, and according to SLA research, the transfer from L1 to L2 will depend on how literate students are. It is unacceptable to say that ESL students have to speak only English at home. If parents are not fluent in English, students will be limited to a seven-thousand-word vocabulary that will not evolve. It will be a replica of their parents speech. What research says is that parents should speak and read in their L1 to provide our ESL students with a basis for developing their English language skills. On the other hand, the development of speaking in an EFL setting will depend on many variables such as intrinsic motivation, multiple opportunities to use the language correctly, professional feedback, exposure to authentic materials, and a lot of hard work. This was true for me. I am an EFL student (and I will always be) and learning English was and still is the most intriguing thing in my life. I cannot fathom the idea of not learning something new each day. Since undergraduate school I have this quotation that has turned out to be my motto, “Who dares to teach must never cease to learn.” by John Cotton Dana. That is true not only for EFL/ESL learners, but also for us teachers. We have to identify the needs of our students and strive to make the best decisions toward our teaching, making sure that our students’ needs be met and that they become world citizens capable of communicating effectively via speaking or writing. I guess I’ll make David’s words mine and say there isn’t much left to add to your comment. I really appreciate the way you complemented it. I’ve learned Dana’s quotation from you, and it’s already been useful in some of my talks about teacher development. I also include myself in the language learner category, and I think that if this ever ceases I should just stop teaching. You’ve made some interesting points here and I’ve enjoyed reading them. I like the comment about writing being able to do more for Ss speaking that the oother way around and I agree that in business and more so in everyday life Ss need to write more. I also agree that it’s not the most popular skill in class and that Ss are hung up on conversaton and like you said it’s probably a result of grammar lessons at school that weren’t communicative. I’ve taken the liberty of linking this post to the #ELTchat summary over on my blog. I hope that you don’t mind! Great post. I’m a great believer in using writing to aid learning, and that writing tasks can be interactive, communicative and motivating. And I especially like the point you make about the link between writing and speaking – and I think, by extension, with confidence too. I’ve seen so many shy, reticent students come out of their shells because they’ve been given the chance to express themselves in writing. Success in writing boosts their confidence in their ability to communicate, and slowly that confidence is transferred to the more “risky” business of speaking. I’m working with a student at the moment in a very mixed ability group (high school students – no streaming). He seemed to be right at the end of the ability scale. Initially he just blocked off the whole lesson. He just didn’t want to be there, so pretended he wasn’t. His affective filter was so palpable you could see it! It’s taken weeks to tease him out of his shell, but in the last couple of classes he’s started to initiate and participate through written exercises. He surprised me – and himself – by producing a whole (coherent and cohesive) text for homework (he’d never done anything up till then). He now smiles and contributes short sentences in class. He looks like he might even be enjoying it! Sounds like a tiny step, but feels like a huge breakthrough. And all thanks to writing. Sorry – I think I’ve strayed off topic, but just wanted to say that writing can play an incredibly important role in language learning if we let it. A family member referred me to this website.